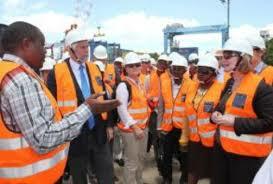 World Bank has approved $345 million for expansion of Dar es Salaam Port.. Courtesy photo. The World Bank said on Sunday it had approved a $345 million (Ugx1.9 trillion) loan for the expansion of a port in Tanzania’s commercial capital Dar es Salaam which the East African country aims to turn into a regional gateway. 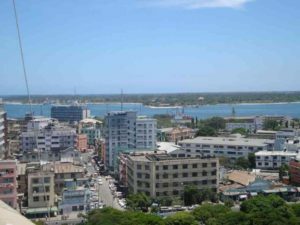 Dar es Salaam is vying with the port of Mombasa in Kenya to become trade hub for landlocked neighbours such as Zambia Rwanda, Malawi, Burundi, Uganda and the Democratic Republic of the Congo, but both ports are hobbled by congestion and inefficiency. The port handled 13.8 million tonnes in 2016 – an increase from 10.4 million in 2011, reflecting an average growth of 9 per cent per year, according to the bank. Tanzania wants to lift its capacity to 28 million tonnes a year by 2020. “The project aims at increasing the capacity of the port and strengthening its economic role in the region,” Richard Humphreys, the World Bank’s lead transport economist, said in a statement. Works on the expansion of Dar es Salaam port set to begin. In a 2014 report, the bank said inefficiencies at the port was costing Tanzania and its neighbours up to $2.6 billion a year. The statement said ongoing infrastructure investments at the port were expected to improve overall productivity and reduce waiting time to berth from 80 hours to 30 hours. “Enhancing its operational potential will boost trade help reduce the current cost of $200-$400 for each additional day of delay for a single consignment,” said Bella Bird, the World Bank’s country director for Tanzania. The loan is the second batch to be approved by the bank for the expansion of the port this year. Tanzania received $305 million in January. Last month, the country also signed a $154 million contract with the state-run China Harbour Engineering Company (CHEC) to build a roll-on, roll-off (ro-ro) terminal to deepen and strengthen seven berths at the port.